We call this guy DBJ. 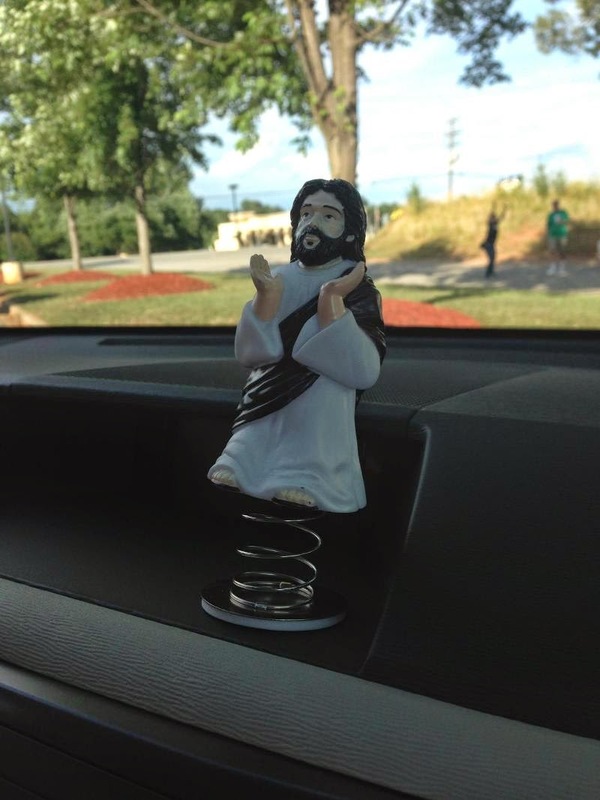 Dashboard Jesus. He's riding in Chaperone 1 (which you may recall is the name of the van that carries a few of our chaperones because we have more than can fit on one bus!). But I digress. At first I laughed when I saw DBJ. That was before we realized how important he is to the chaperone universe. Let me explain. No. There is too much. Let me sum up. A police officer, a van trying to catch up to the bus, and DBJ are all within 100 feet of each other. What happens? Nothing. Absolutely nothing. Why? Because DBJ, that's why. Fast forward a little bit. The chaperones need an extra cup holder. So DBJ gets moved. Let me just interject that I can't understand why they didn't put the water in the cup holder and then put DBJ on top. But I digress. Again. Anyway, DBJ wasn't at his post. As a direct result, the van followed the bus through a toll plaza. Without paying a toll. That's a $400 fine. The parents among you will recognize that dollar figure, I think. "Put DBJ back in place!" So they did. Then they turned back to figure out how to pay the toll. And DBJ helped them catch back up to the bus. Thanks, DBJ. Let me say this is not product placement. One of the reasons I love staying at Hampton Inn is that they have a small hot breakfast. I mean, it's simple. But it's good. And they have waffles you can make. I took a picture of my plates this morning. I'll post those tomorrow. The breakfast place is also a great place to catch up. Like right now. I'm typing on the blog while Jonathan gives Bennett a hard time about his bed head. I don't think we need a picture of that. But how about a few pictures of folks enjoying the breakfast food and fellowship? This was our venue Monday. It's a Methodist retirement home in Richmond. It was a nice big room, complete with a stage and a piano (2 for 2 on venues where we don't have to take in the keyboard, which is good because we've been running behind to both...hoping the lack of long distances up here will correct that for us!). Couple of pics from farther back. Because America, that's why. ...which is not to say they don't have personality. It is, after all, the tenors that started the choreography for "He'll Make a Way." Check out Andrew back there. And Steven. Note to self. They aren't allowed to stand next to each other anymore. Like I said...good concert. But the best part was, as it frequently is, the visiting afterward. I'm not sure who's happier in these pictures: the seniors or the youth. After the concert we headed to lunch. It was our normal "we're on the road, so just find a place where there are lots of choices and kick everyone off the bus for a while" meal. The kids get tired of that pretty fast. It's not because they're picky, at least according to Tric. She took a picture of the pizza below--and she shared with me that it was quite possibly the worst pizza she has eaten in her entire life. That judgment pronounced after a single bite. I didn't ask if she spit it out. I don't think I want to know. I had Chipotle, where I pondered the deeply philosophical question: why would you make a Mexican place with no cheese dip? Opened up my email and realized I forgot to post this picture from Sunday's concert. These are Katie's grandparents who came to see us. Always great to see family! Up for today, we're singing a concert this morning, eating lunch, singing a concert in the afternoon, heading to Rhode Island (which I now believe exists because Paul is from there! 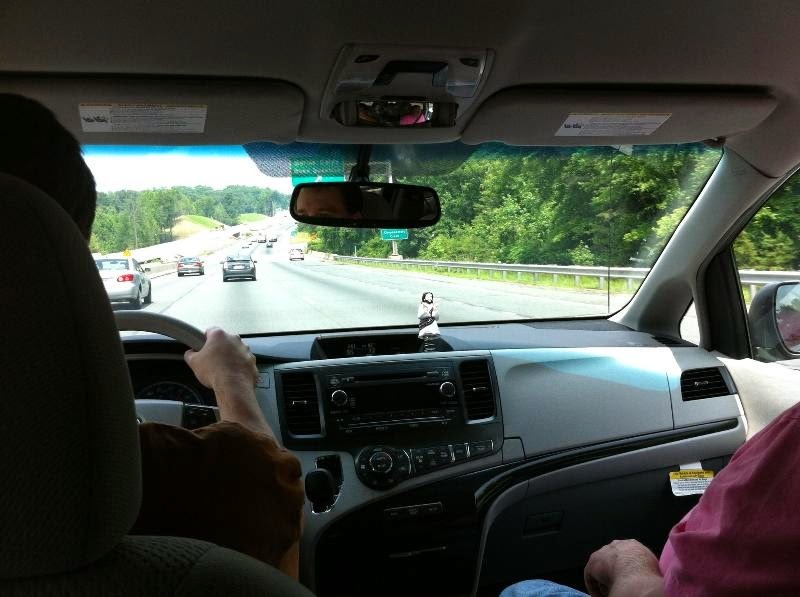 ), going to the Cliff Walk (of which I'll send pictures later...it sounds cool). Then to the hotel. We really need to have devotional in the hotel tonight! Kindof looking forward to that. And dinner. We need to eat dinner. I'll have to find the best place to do that from the Petersens. Though the time I was able to spend on tour with the choir was short, I was mighty impressed. First, these youth can sing! Second, they can relate to people. As good as the concerts are, the interaction with the people who came to hear it is even better. Now that both of my parents live in assisted living residences, I understand all the more how important that is. Third, this group knows how to tour. Here's a huge shout-out to John, Mitch, the co-workers from DFUMC, and their counter-parts from Embry Hills. I've made a lot of overnight tours with youth groups over the years. This bunch knows how to live and work together on the road. And "Father John" knows how and when to use both humor and discipline. Fourth, a huge shout out for this whole venture being mission-minded. "People served in mission" -- Jesus loves that. And speaking of Jesus . . .